The weather turns cold and a young girl’s fancy turns to gratin. 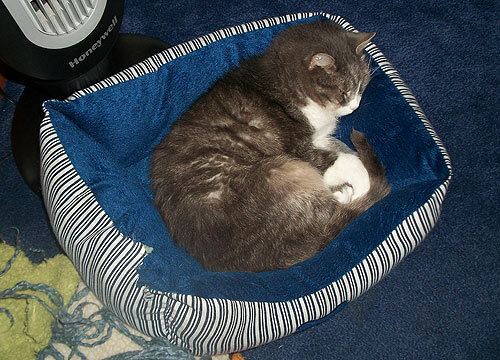 Even the cat “occupies” his own bed in this weather, showing solidarity or simply hogging the heater? Theories can be found here. But back to the gratin. I have a lovely French friend from the part of France where the authentic gratin dauphinois comes from and I’m sure she would want me to point out that the real thing is just thinly sliced potatoes, butter, and cream — seasoned with salt and pepper and maybe a grating of fresh nutmeg. 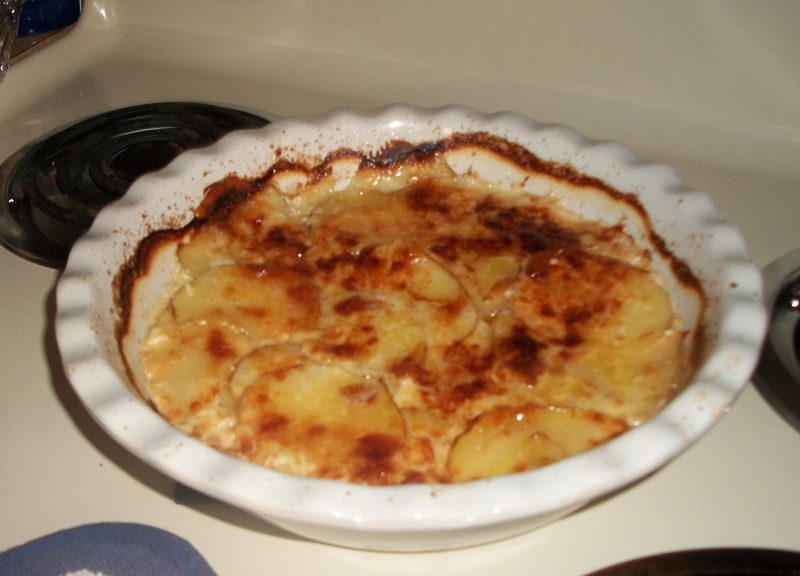 Here in the U.S. where our butter and cream aren’t good enough to eat on their own, we have to tart up the recipe with cheese, lending the dish the flavor of our “potatoes au gratin” or scalloped potatoes — which yes, are very similar but not exactly the same (here’s my post on my experiment with trying to do vegan scalloped potatoes with fake cheese — not a huge success). I would argue that unless you can get really good fresh butter and cream (there’s nothing wrong with our American potatoes if you use the tastier varieties such as Yukon Gold), you should opt for the cheese version, which may very well be Swiss, now that I think of it, since it traditionally includes Gruyere, a fancy, aged cousin of the Swiss cheese we put on our sandwiches. 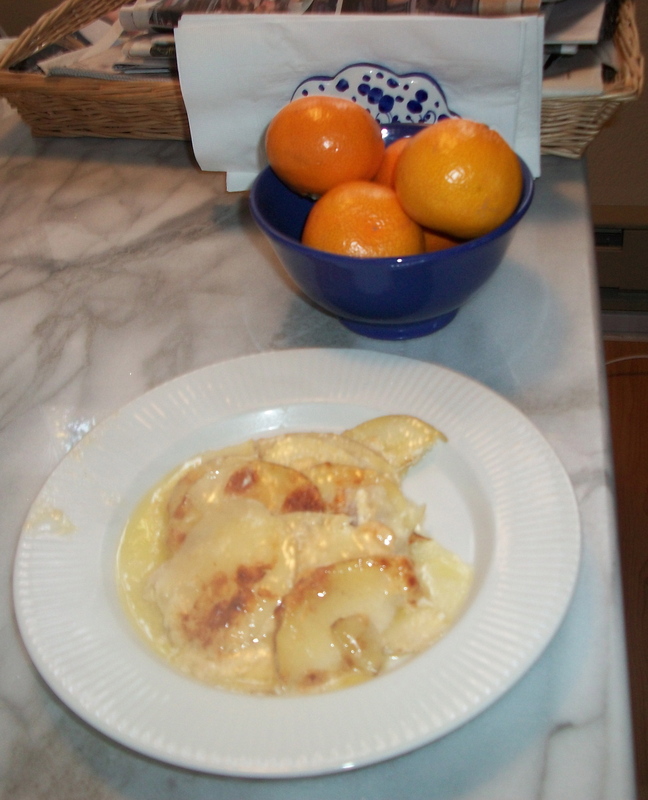 Gratin is a great recipe because it is easy and quick but divinely delicious if done right. I surfed around the inter-webs to pick up “gratinéeing” tips and found some fun and interesting sites, including one called http://www.gratindauphinois.com, a portal to the “best” of the Dauphiné region, including recipes for gratin and more. My favorite was a blogger who says: “Here in Grenoble, we eat gratin dauphinois. And it is DELICIOUS! But what is the REAL recipe for gratin dauphinois?” She goes on to include several links to recipes — all of which I consulted with pleasure. 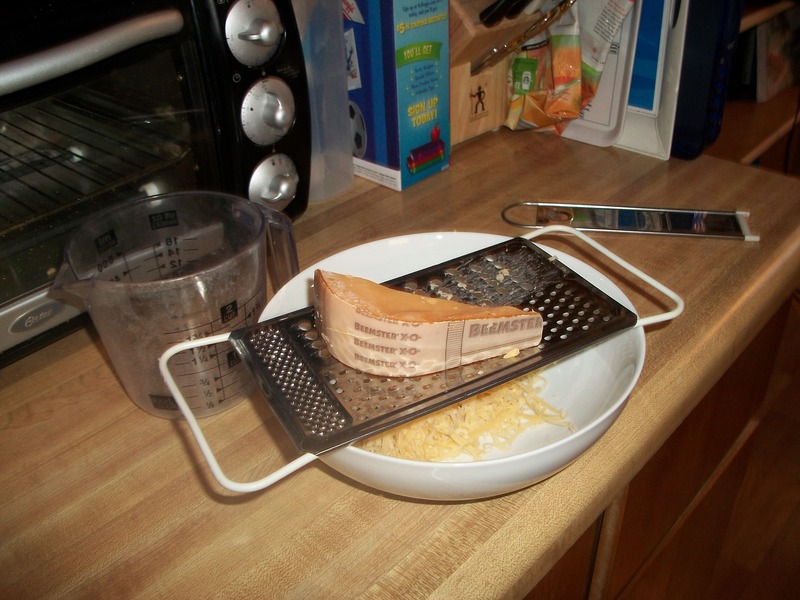 Because the cheese version calls for aged, hard cheese, the lactose will have left the cheese long since. I used a really nice ancient Beemster which was wonderful and nutty. It has to be a strong cheese, I think, if you want the authentic taste but most cheeses that are old enough to have shed their lactose are pretty strident so you’re safe. I used lactose-free dairy milk but unflavored coconut milk would work as well, preferably the canned kind because you need the fat. I wouldn’t use soy milk though or any of the nut milks. You have the right write your own personal variation. Use at least 10 verbs in the subjunctive tense. Preheat your oven to 300 and pick a relatively shallow baking dish such as a ceramic tart or pie dish. I read conflicting things about using Pyrex but my instinct says no, it won’t get hot enough fast enough. “Season” the dish with your garlic by rubbing it all around the dish. Discard the garlic clove and then drop in olive oil in the dish and spread it by tilting the dish so you don’t rub off the garlic. I found this was easy to do because I left the dish on top of the warming oven for a moment and the heat made the oil easy to distribute. Slice your potatoes as thinly as you can. Everyone recommends a mandolin for this but I don’t own one, so I just used the sharpest knife I have and set aside pieces that came out too thick for another dish. I read online that putting cut potatoes in ice water in the fridge keeps them from turning brown so I am doing that right now and will let you know. How do you know if your potato slice is right? If it looks like you could fry it up into a potato chip, it’s perfect. Anything else is too thick. 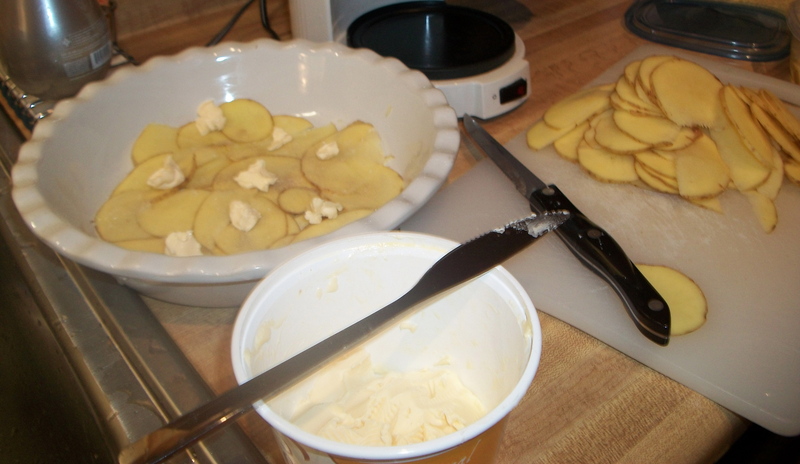 Layer potato slices thinly along the bottom of your oiled pie dish and then salt, pepper, nutmeg if you’re using it, and sprinkle a third of the cheese. Put dollops of the Earth Balance (a third of the total) all over it and layer another potato layer. Repeat. You should have three layers when you are done but make sure they are THIN. Pour the milk over the whole thing, cover with foil, and cook 30 to 40 minutes in the oven till potatoes are tender (they will be). Remove foil and turn the oven up to 425 for a final 10 minutes or so until the cheese on top browns up nicely. Allow the dish to rest briefly before serving hot with a dry, chilled white wine. This entry was posted in Baking, Casserole, French food, Gluten-free, Lactose-free, Potatoes and tagged gratin without lactose, potato gratin. Bookmark the permalink. I do love the stuff you bake, but I have to admit your Gratin was one of my favorite dishes you have ever made. They were so thin, and delectable. A wondrous lunch.